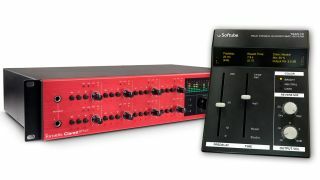 From today, Softube's Time and Tone pack will be offered as a free bundle with eligible Focusrite interfaces. The Pack includes the TSAR-1R reverb, Tube Delay and Saturation Knob plugins and will be bundled alongside the already included Focusrite Red 2 & Red 3 plugin suites. Focusrite has backdated the offer, so if you purchased an eligible interface on or after 1 September 2015, you can can download the plugin bundle for free (providing you're a registered customer, that is). Eligible Focusrite interfaces are: Scarlett Studio, Scarlett Solo Studio, Scarlett Solo, Scarlett 2i2, Scarlett 2i4, Scarlett 6i6, Scarlett 18i8, Scarlett 18i20, Saffire Pro 14, Saffire Pro 24, Saffire Pro 26, Saffire Pro 40, Liquid Saffire 56, Clarett 2Pre, Clarett 4Pre, Clarett 8Pre and Clarett 8PreX. For more information and pricing, head on over to the Focusrite website.